Bob Hoskins, Patricia Arquette, Gérard Depardieu, Robin Williams, Jim Broadbent, Christian Bale, Eddie Izzard, Elizabeth Spriggs, Peter Vaughan, Julian Wadham, Roger Hammond, Ralph Nossek, Neville Phillips. In The Secret Agent, the great Polish born author Joseph Conrad explores the confused motives that lie at the heart of political terrorism. Playwright Christopher Hampton (who also wrote “Dangerous Liasons”) does a credible adaption of this dark tale of revolution and betrayal. 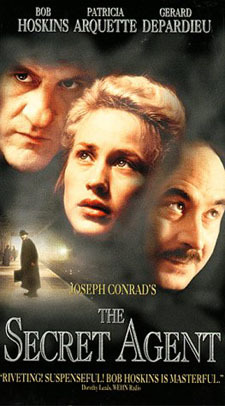 This small independent film features an intriguing cast of Bob Hoskins, Patricia Arquette, Robin Williams, Gérard Depardieu and Christian Bale. Released in 1996, Philip Glass’s score performed by the English Chamber Orchestra captures the moody desolation of nineteenth century London and the madness and desolation that is at the center of Conrad’s novel. Written by Joseph Conrad (novel), Christopher Hampton.